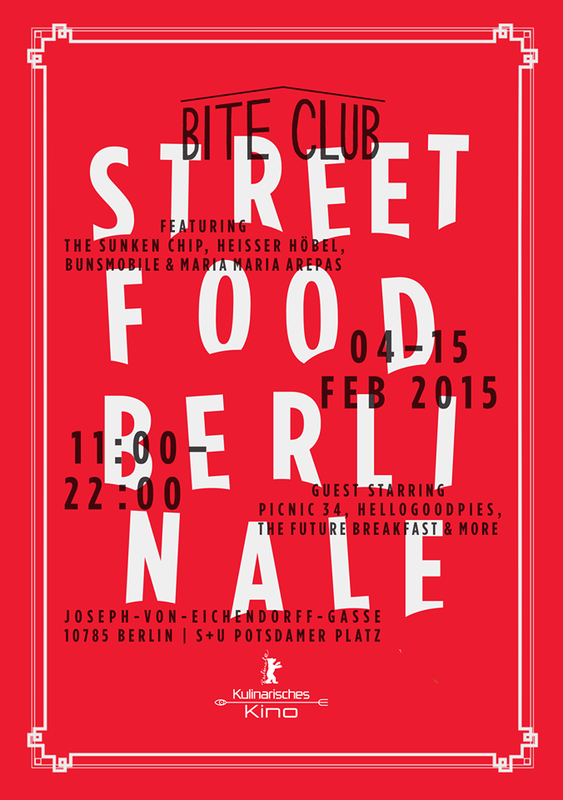 Bite Club’s popping up at the Berlinale – Berlin International Film Festival! We’ll be there over every day to nourish and sustain the most sun-deprived cinema-goer. ★ The Sunken Chip: driving all the way from Paris with a truck full of pickled eggs, to bring Berlin that golden treat – proper fish and chips. Using sustainable fish, with chips and mushy peas on the side. Winners of Le Fooding award for a reason. Don’t miss! ★ Bite Club Cafe: Bonanza Coffee, fresh bio milk from Ökodorf Brodowin, hot toddies, cakes and pastries by Tausendsuend, craft beer and German wines. ★ Bunsmobile: Our favourite big yellow truck will be representing with their freshly-ground chuck/short rib hamburgers, homemade sauces and naturally, Viktor, Berlin’s hungriest Jack Russell. ★ Heisser Hobel: Bergkäse produced by chef Florian’s parents in Bavaria is the key ingredient in their velvety Spätzle – winner of ‘Best Overseas Trader’ at London’s European Street Food Awards. ★ Maria Maria Arepas: Columbian cornbreads are freshly griddled and filled with inventive combos like ‘Big Shrimpin’, prawns on the plancha with guacamole and mango sauce, or ‘Magic Mushroom’, a grilled Portobello mushroom with feta, salsa and guacamole. Non-GM and gluten-free! ★ The Future Breakfast: Graced with the presence of an elegant brindled whippet, this little truck focuses on sustainability and regional produce for their special ‘Benedict Berlinale’, with kale, sous-vide salmon, poached egg and hollandaise sauce. ★ Hellogoodpie: Our favourite Irish pie master returns with a cute new truck laden with crisp-shelled goodness. Fillings include the ‘Popeye’ with spinach, feta and walnut or a sweet apple pie with custard. ★ Woop Woop Icecream: The science lover’s truck, serving fresh and hot waffles, hot toppings, hot chocolate and of course ice cream, made from ingredients of your choice with the power of liquid nitrogen. Add fresh fruit, nuts, sauces and chocolate.